2012 will recognise the 21st Anniversary of the Independence of Artsakh / Nagorno-Karabakh and to celebrate this I have compiled a collection of 21 Images from my 6 visits to the region which represent 21 personal perspectives. My first visit to Nagorno-Karabakh was to Shushi and my initial impression was affected by the abundance of unsightly ruins. But very quickly I saw through that and learned to love it. One can never miss the opportunity to stand and stare at Ghazanchetsots Cathedral, an icon of the City. Damaged during the war and used by the Azerbaijanis to store weapons, it has now been returned to its former glory, rising proudly above the skyline; an important focal point for the area. Another great symbol of Independence. Bishop Barkev Madirosian was a key figure in the community during the war and has remained a prominent representative in Nagorno-Karabakh during the last 20 years. I have not had the good fortune to meet him, personally, but I did listen to him speaking during the service after the event to commemorate the 20th Anniversary of the Liberation of Shushi. He has great presence and represents, metaphorically, how, despite the past, there is a present, and, very much, a future. Following the end of the war many soldiers did not return back to their families; it is not clear whether they are dead, held hostage by the Azerbaijanis ( for which some evidence does appear to exist), or just never returned through free-will. What is known is that there are many families who have still not “buried” their loved ones and so continue in a state of unresolved grief… 20 years after the ceasefire. The Centre for Missing Soldiers in Stepanakert, untiringly keeps a record of all those people, and continues the “search” on behalf of the grieving families. Wall of missing soldiers from the Nagorno-Karabakh war from the Centre in Stepanakert – Chaired by Vera Grigoryan. I visited a family who had a tragic story to tell of how their son, who was fighting a battle in the Fizuli area towards the end of the period of conflict in 1994, disappeared and, to this day, remains unaccounted for. Every day gives new hope of a phone call, a knock on the door, a letter through the post….or contact from the Centre for Missing Soldiers. Their grief has been placed on hold since that day. There have been too many false alarms…but there is tomorrow. The Grigoryan family from Stepanakert with a picture of their son who has never returned from the war, and has not been declared dead. There are many personal stories of how people suffered during the war ; these are people with no political agenda apart from the wish to live peacefully in their own home, and bring up their family in a safe environment. Ararat Arakelyan was one of many men during the period of Operation Ring who were forcibly removed from their homes by the Azerbaijani OMON, leaving their families, to be taken to Khojaly and Shushi and then beaten, tortured as a form of extortion. Many had to pay money in order to be released. Although severely beaten, and still suffering from his torturing to this day – he is happy to be able to be part of the upbringing of his grandchildren. Ararat Arakelyan, his wife and grandchildren. He survived being tortured during Operation Ring. Each year the People and the Dignitaries from Stepanakert, Nagorno-Karabakh, and Armenia pay their respects to those who fell during the War. For many it brings back memories, and the need for some quiet contemplation and remembrance by the gravestones. A woman remembers one of her fallen menfolk from the Nagorno-Karabakh War in Stepanakert Cemetery. 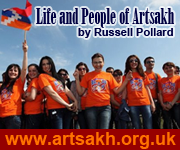 In 2012, a delegation of senior people from the Artsakh State University walked through Stepanakert to the Cemetery. Many people from the University played a significant part in the original Declaration of 1988 to join with Armenia, as well as being involved in the planning for the liberation of Shushi in 1992. They are joined by students from the City wearing the iconic “20th Anniversary of the Liberation of Shushi” T-Shirts. On May 9th the Military parade trundles through Renaissance Square in Stepanakert. The might of the hardware providing re-assurance to the People of Nagorno-Karabakh that they are always prepared to defend their Freedom and to maintain Peace. The Armed Forces are only ever used for defensive purposes. On the 20th Anniversary of the Liberation of Shushi a number of groups of people followed the original routes of the Liberation forces from Stepanakert to Shushi finishing at Ghazanchetsots Cathedral. Our group, with only one Englishman, had to make the steep ascent from the river up the gorge into Shushi. Whilst tired, we were jubilant and respectful of those soldiers who had followed the same course under much more trying circumstances. On 7th September 2012 Bako Sahakyan was inaugurated for a 2nd term as the President of the Nagorno-Karabakh Republic. The ceremony was witnessed, in the Youth Centre, by members of the public, politicians, and armed services, as well as Serzh Sarsyan, the President of Armenia. His election re-inforced the democratic principles of the country and further cements its position as a state with modern, globally accepted, political processes, and one worthy of its Independent status. 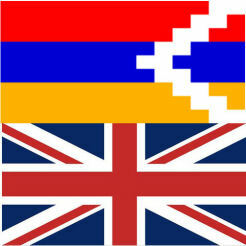 Nagorno-Karabakh is a very religious place, and people worship under the principles of the Armenian Apostolic Church. Religious devotion and overt symbols of belief are prevalent here, as is the case in Armenia. Although I am not a member of any Church in the UK I was very moved by the services that I attended and am in awe of the faith that people have. Guidance and direction by God is an extremely important part of life for all ages in this region. It provides comfort, reassurance and a future for many people who are engaged in a difficult situation. For a relatively small place, Stepanakert seems to have many weddings. They are about community, family, tradition, nation, dancing and music….and driving fast on the roads with car horns blaring; an exciting tradition. I had the opportunity to join a wedding for the day and see all of the various stages through to the reception in the evening. Weddings are such an important part of the future of Artsakh – more so than other places. Two old men, cheerfully, sit outside the village shop, talking to people as they pass by. Life in the village is grounded in an ecologically sound style of living, but finances for most people are very tight. The sign on the shop door <<ՊԱՐՏՔՈՎ ՉԿԱ>> (No debt) says it all ; it is common practice for people who have little cash to buy goods on credit relying on the goodwill of the shopkeeper, however in the villages this is not always possible as money is scarce for everyone. Walking through Stepanakert on a school day can be like any other modern city with the general rush of parents dropping off / picking up children from the gates and taking them home. Education is as important here as anywhere else – in some respects I think it is considered to be more so as this is the only way that the country has a future. Shortly after the Liberation of Shushi in 1992, Zakar Keshishyan and some fellow students braved the trip from Armenia into Artsakh through the Lachin corridor. Their aim was to bring music to the area. From that day, he has returned to Shushi for 4 weeks each year, from his home in Lebanon, to teach and encourage the performance of music by children and young adults from the region. 2012 was his 20th year, and the concert finished with a brief celebration of his contribution and commitment. An impressive and devoted Armenian. Zakar Keshishyan is recognised for bringing music to Shushi for the last 20 years. Shushi was always known as the Cultural Capital of the Caucasus. During the war and over the last 20 years this has been less prominent as other priorities have existed. Even today one may judge that money and efforts should be concentrated on re-building the infrastructure. The re-establishment of Shushi as this Centre is gaining momentum and the number of Cultural events is always increasing. Art and Culture is a great leveller and is apolitical. 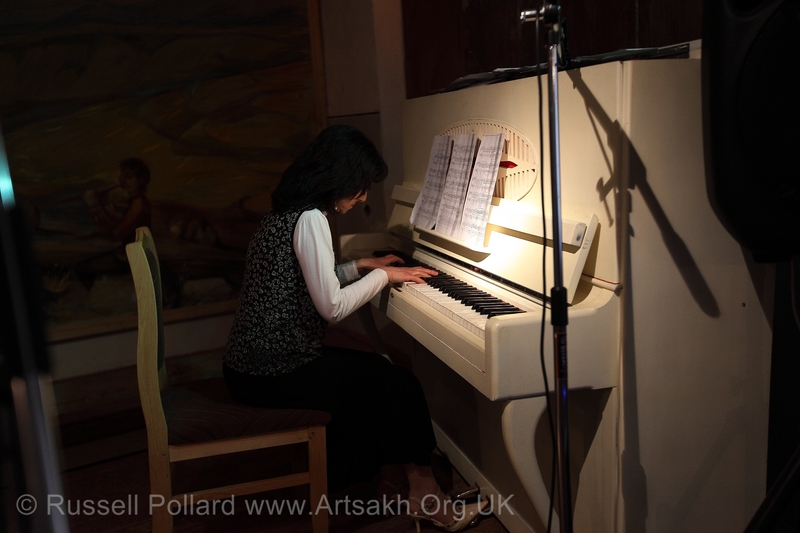 Opportunities have already existed where people from Artsakh have played outside of the Country. As time goes on this will gain greater acceptance in the global community and, by stealth, people will begin to recognise that Artsakh exists as an Independent nation. At a festival in Shushi, this young boy symbolically raises the flag of Nagorno-Karabakh with all his strength – never forgetting that this is what his parent’s and grandparent’s generations fought for. His / Its / Their Independence. No trip to Artsakh is complete without a visit to Tatik-Papik; whilst the image is very familiar, in reality it is profound, and awe-inspiring. The symbolism is more than grounded, it is buried deep in the soil. For as long as this monument keeps a paternalistic/maternalistic watch over the country, it will, forever, remain Independent. 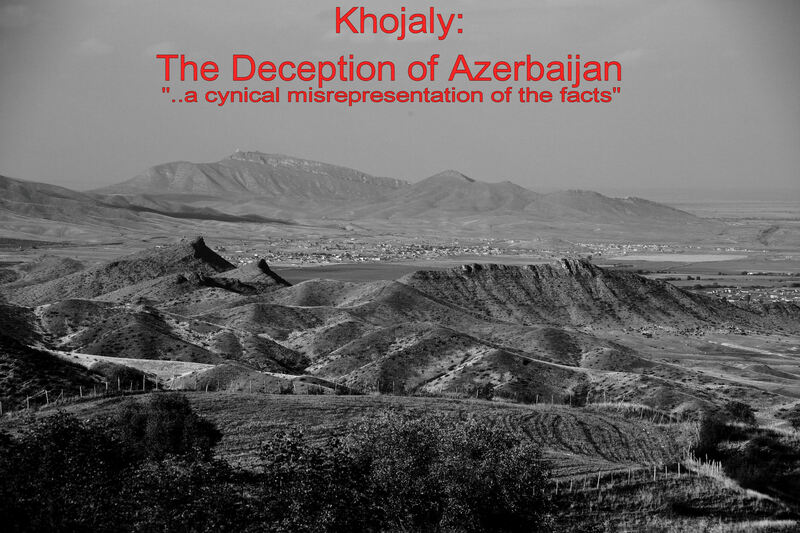 On December 10 1991, A Referendum was held in the Nagorno-Karabakh Republic…. 108,615 persons or 99.9 per cent of the total number of voters answered “Yes” and 24 persons or 0.02 per cent answered “No” to the aforementioned question. 95 ballots or 0.09 per cent were recognised invalid.